A new program “Cumprimento REH existentes” has been created to help users with the energy certification procedure of existing buildings. Using this program version (2014.l) and from the Cypeterm tab of CYPECAD MEP of Portugal, this energy justification can be obtained and the data exported to the new program. Furthermore, the “Cumprimento REH existents” program is the analysis motor Cypeterm uses to obtain the certification. This new program allows users to customise the properties of the systems and construction elements that intervene in the energy certification of existing buildings. The normal procedure will be to use CYPECAD MEP and, if necessary, customise some of the properties of the systems or construction elements, then export the data to the “Cumprimento REH existentes” program. SR EN 1991-1-4/NB (2007) Eurocode 1: Actions on structures. Part 1-4: General actions – Wind actions. National annex (SR EN 1991-1-4/NB). Normas técnicas complementarias para diseño y construcción de estructuras de concreto. Used in the rest of Mexico. 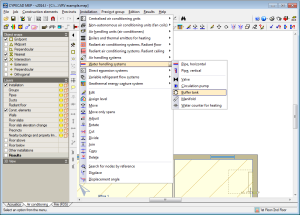 CYPE’s “Floor slab sheet editor” is a free software program. The program is included in the CYPE program installation DVD. It is available in Spanish for Mexico and Spain, in Catalan and in Portuguese for Brazil and Portugal. The file which installs the program is located in the “Install individual programs” directory of the installation folder of any of the indicated languages. Please recall, that when the complete CYPE program version is downloaded from the download area of our website, it consists of a compressed file containing the CYPE software installation DVD. CYPE’s “Floor slab sheet editor” is used to introduce data sheets for precast, reinforced and prestressed joist floor slabs that are not included in CYPECAD. The “Floor slab sheet editor” generates an FVA format file which CYPECAD can import and then use the floor slab data sheets that have been introduced in the editor. This is a very useful tool for users wishing to analyse and design projects containing precast, reinforced or prestressed joist floor slabs not included in the program (if they have been provided with data sheets from the manufacturers), and for manufacturers wishing to provide CYPECAD users with the properties of the precast, reinforced or prestressed joist floor slabs so they may be used in their projects (if the manufacturers’ joist floor slabs are not included in CYPECAD). More information can be found on the “Floor slab sheet editor for precast, reinforced and prestressed joists” on our Spanish webpage (Download, Installation, Data introduction...). A link is also available on the same webpage to download a compressed file to install CYPE’s “Floor slab sheet editor for precast, reinforced and prestressed joists” individually for the indicated languages. As of the 2014.l version, CYPECAD MEP allows users to include buffer tanks in heating and air conditioning water handling systems. These elements can be found in the Air conditioning tab > Installation > water handling systems > Buffer tank. With this configuration, the buffer tank, as well as acting as an accumulating volume in the installation, acts as a hydraulic separator, separating the primary and secondary circuit. Regarding the accumulated volume, the program calculates a recommended volume depending on the type of production and installation. However, users’ criteria still prevails, due to the wide range of recommendations currently available to establish the optimum accumulation volume for this type of installation. The 2014.l version of Novo Cypeterm includes an option which allows for the calculated data to be exported to a file in XML format, so that this data can be imported directly from the ADENE webpage (institution in Portugal in charge of the Energy System Certifications of Buildings – SCE). This way, users can avoid the laborious manual introduction of all the data and save a substantial amount of time when requesting the “Pré-Certificado” or the respective Energy Certification. The 2014.l version of CYPECAD MEP includes for Novo Cypeterm, the energy certification of existing building in the REH area. To obtain this certification, a new report, Relatório de peritagem, has been added. Furthermore, the data introduced in Novo Cypeterm can be exported to the new program: “Cumprimento REH existentes” (which can be accessed from the “Documentação” program group in the main CYPE software menu). In CYPECAD MEP, users define the systems and construction elements and can export them to the “Cumprimento REH existentes” program, to customise all the properties of the data that intervene in the energy certification of existing buildings in accordance with the REH. As of the 2014.l version, users can export Gantt charts generated by Arquimedes to XML format. Therefore, the chart can now be exported to MPX format (available as of previous versions) and XML format (new feature as of the 2014.l version). The 2013 version of Microsoft Project no longer accepts files in MPX format, not allowing the Gantt chart generated by Arquimedes to be imported, as this was the only format Arquimedes exported the chart to. Now, with the option to export to XML format, Microsoft Project can read the chart generated by Arquimedes.